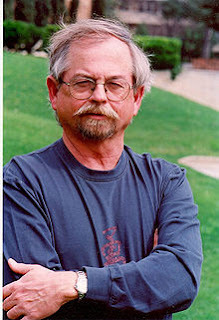 My friend Palmer Hall recently died of lung cancer. 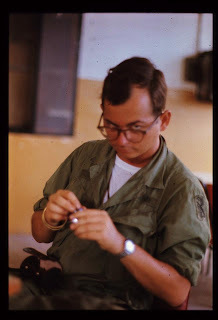 He was a poet friend I only met face to face twice, but we carried on a correspondence, and I read his blog post memories of his years in Vietnam, and his poems about Vietnam. Army greens, flak jacket, camouflage boots, helmet. out against the sky / like a patient etherized upon a table." Innisfree almost becoming a mantra. pale Ramon!) mingled with red dust and death. dew / or that the Almighty had not fixed his canon gainst self-slaughter." but I remember none of the generalities. plowed under, struggles, shoots up. convince myself to regret never having been. silent, wrung dry in the hot sun. translate what eyes have seen. that can not push up or out. eyes searching for movement in the dark. of those deep jungles where his body lay. remote from the throbbing space that whispers in her blood. "Yes, it's raining." I say. "Yes, your sons are here." She feels the lump in her breast, a pressure, a weight. She says "I don't need it anyway. My sons are grown." it is to be polite, to kiss, to hug, to shake each hand. "I'm fine," she says. "I only need a little sleep." She smiles. I take her hand, slip the puppet on. dealing with Viet Nam, (Hall, H. Palmer. 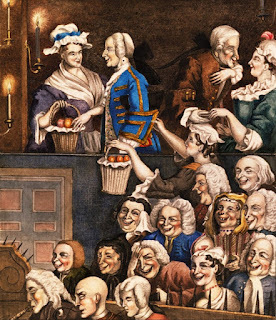 From the Periphery: Essays and Poems. San Antonio: Chili Verde Press, 1994.). 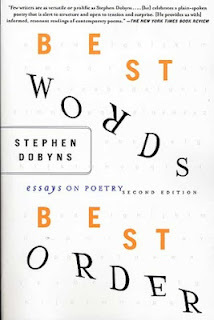 I’ve been re-reading the essay on Metaphors in Steven Dobyns’ great collection Best Words, Best Order. It’s really helping me as I read and comment on my students’ work. Anyway… the online workshop is going pretty well, though I have two or three students who are not posting poems for comment. They are not very secure about their poems, though I know no one in the class is going to say anything really critical about their poems. It’s all a matter of development. Why did I decide to put the workshop online instead of devoting each class to it? 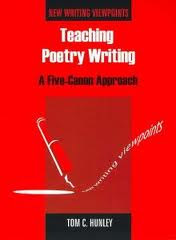 Because I read Tom Hunley’s book Teaching Poetry Writing – A Five-Canon Approach. He said that the workshops work for MFA or other graduate classes, but the undergrads don’t know enough about the craft of poetry to give really constructive suggestions during a workshop. Since I did have the experience of teaching a 200 level creative writing class last year, where we did have in-class workshopping, I agree with him. So in class we have been writing, and for homework they have been writing. So the class before Spring Break, each member of the class had to turn in 12 poems to me. I’m reading them over break, and will meet with each of them in a one-on-one conference the Thursday we come back. My twelve students run the gamut as far as talent/skill go. They all need work… as I did when I was 20 years of age , and as I still do now. So I know I am going to use some of what Dobyns says when I meet with each of them next week. “…”Obscurity must be a tool. It works to force the reader to ask questions that will direct him or her to an understanding of the poem. Any question that does not increase our understanding detracts from it. It hurts to be obscure about the intellectual, physical and/or emotional contexts of the poem in the same way that it hurts to be obscure about the object of the metaphor. … Often, when one of more of these contexts in unclear, a poem will be criticized as being too private which usually means that the writer is withholding too much information. 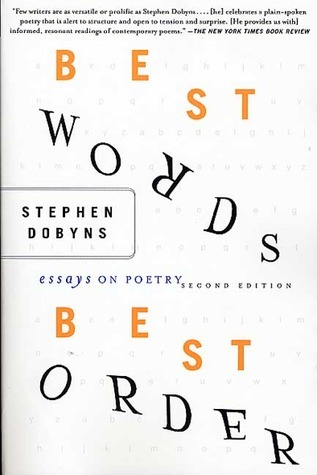 The result is the reader isn’t able to examine the relationship between one or more of the three contexts and the narrative, which limits his or her access to the poem. 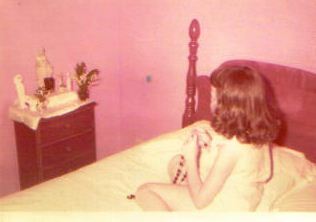 There I am at age eight with my May Shrine... fuzzy photo with fading color from 1956. In February 2010 I attended the AWP’s National Conference in Washington DC. The AWP stands for the Association of Writers and Writing Programs. I love this conference; it’s the second one I’ve attended. Meeting my poet friends in person – people I’ve corresponded with, have been Facebook Friends with, those with whom I’ve interacted at the West Chester Poetry Conference over a number of years – they are all there! This must be the same for Jewish writers. It must be that the Catholic culture has permeated their unconscious even when they no longer espouse the practice of the religion. However, I fervently wished that I had been invited to be on that panel, so that I could speak from the vantage point of one who was “raised Catholic” but who, in adulthood, had made the choice to be a practicing Catholic – and not only that – to enter a religious community – and to remain both in the community and in the Church --- in spite of everything. 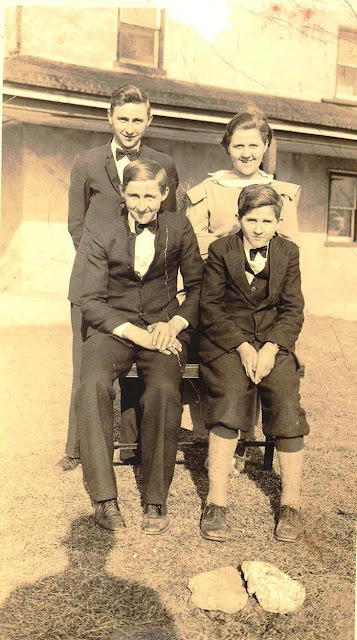 In the last few years, really getting to know my Mennonite first cousins and Amish second cousins, I’ve come to realize how their history is filled with their persecution by the Catholics, and I am glad they don’t hold that against me. I’m glad to be united with them in the Gospel. I have had conversations at poetry gatherings with other writers who ask me that question: how can you stay a member of this Church when women are treated as second class citizens? When the authority structure is medieval? When the clergy abuses have been made public and have scandalized so many? Good question. “the world is charged with the grandeur of God.” The sacramental inscape of things and persons. In my opinion, self-righteousness is one of the most dangerous sins – the sin of good people – the sin of the Pharisees. As my friend Eliot says, I’m here to kneel where prayer has been valid… and humility is endless. Last week I finished listening to this novel on my iPod. Have been putting off listening to it, and I am not sure why, since it received such glowing and interesting reviews, and since it won the Booker Prize this past year. 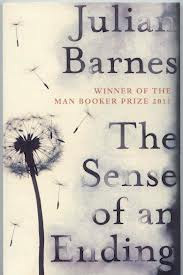 Andrew Blackman in his blog The Writer’s Life talks about Julian Barnes’ novel The Sense of an Ending. -and from Justine Jordan “Barnes is brutally incisive on the diminishments of age: now that the sense of his own ending is coming into focus, Tony apprehends that "the purpose of life is to reconcile us to its eventual loss", that he has already experienced the first death: that of the possibility of change. Back to my own thoughts on this. 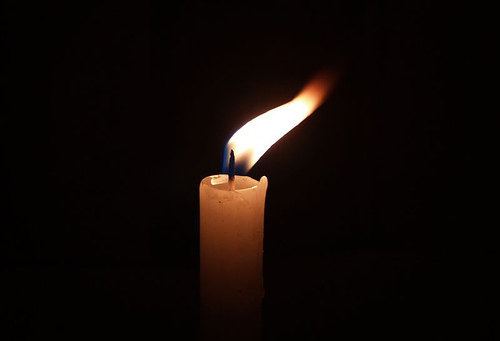 That quote “much of what we think is important is rendered utterly irrelevant by the passing of time.” That is so true when I try to remember some things I thought were terribly important at 18, or at 21, or maybe even at 35. I am embarrassed by some of them today. So then, what was important that I didn’t give my attention to? That I wish I could go back and do again? Talk with my mother about her family, her childhood. 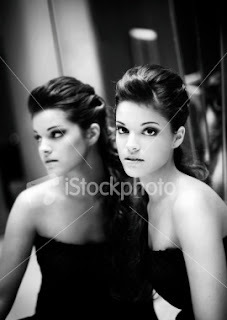 For instance: How old was she in this photo? Whose house is that in the background? Who is taking the picture? She didn’t want to talk about her childhood,because she said it was too painful, and I wasn’t really interested in hearing it, either. That’s just one inquiry I regret not making while she was alive and still remembering. For some reason, that passage really hit me. Need to write about that more. What are the new emotions that time brings?